(Nanowerk News) Professor Myungeun Seo’s research team from the Graduate School of Nanoscience and Technology at KAIST developed a method to form micropores of less than 2 nanometers within porous polymers where 10 nanometers long mesopores are connected like a net ("Hierarchically Porous Polymers from Hyper-cross-linked Block Polymer Precursors"). The best feature of the porous polymers is the fast absorption of molecules. Net-like Structure of Hierarchically Porous Polymers with Mesopores and Micropores on the walls of Mesopores. 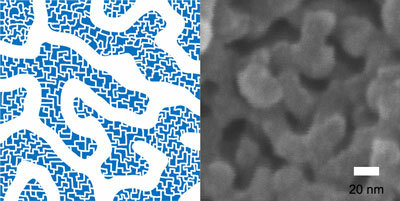 Porous polymers that have micropores of less than 2 nanometers like a zeolite have a large surface area. They are used as a means to store molecules like hydrogen or as catalytic support that can be used as a surface to convert a material into a desired form. However, because the size of pores on its path was small for the molecules, it took a long time to spread into the pores and reach the surface. In order to overcome such an issue, a lung in our body or a vein of a leaf has a structure wherein the pores are subdivided into different sizes so that the molecule can spread throughout the organ. A technology that can realize not only micropores but also bigger pores was necessary in order to create such structure. The research team solved the issue by implementing self-assembly of block polymers that can easily form a net-like nanostructure from mesopores of 10 nanometers. The team created hierarchically porous polymers consisting of two different types of pores by using hypercrosslinking reaction along with the self-assembly method. The reaction creates micropores within the chain after the polymer chain is confined by a chemical bond. This porous polymer has micropores that are smaller than 2 nanometers on the walls of mesopores while 10 nanometers long mesopores forming 3 dimensional net structure. Because of the self-assembly method, the size of mesopores can be adjusted within the range of 6 to 15 nanometers. This is the first case where a porous polymer has both well-defined mesopores and micropores. The research team verified the effect of hierarchically porous structure on absorption of molecules by confirming the fact that porous polymer had faster absorption speed than a polymer consisting only of micropores. Professor Seo said, “The study has found a simple way to create different sizes of pores within a polymer.” He expected that the hierarchically porous polymers can be used as a catalytic support in which fast diffusion of molecules is essential, or for molecule collection.